Private Collection of the author. Vinayak Chaturvedi is Associate Professor in the Department of History at the University of California, Irvine. He is the author of Peasant Pasts: History and Memory in Western India (2007) and the editor of Mapping Subaltern Studies and the Postcolonial (2013). His book on the intellectual history of Hindu nationalism is forthcoming. Here he discusses his latest research project on tennis and its imperial connections. You’re currently working on the history of tennis. How did that project evolve? In the same year, Said’s memoir Out of Place was published, in which he examines the themes of identity, anti-colonialism, resistance, racism, authority, and etiquette as part of a discussion of tennis—a sport that Said played throughout his lifetime. However, Said’s brief writings on tennis are the closest we come to a political analysis of the sport. Perhaps the other major figure whose writings can be placed within this category is Pierre Bourdieu, who explains that his conceptualization of habitus in Algeria was, in part, informed by his training as a tennis player. It appeared that there was a lot more to the history of tennis and its relationship to histories of empire that simply have not been discussed. Said alludes to this in his work, but he is not concerned about developing an early history of tennis in the British Empire. 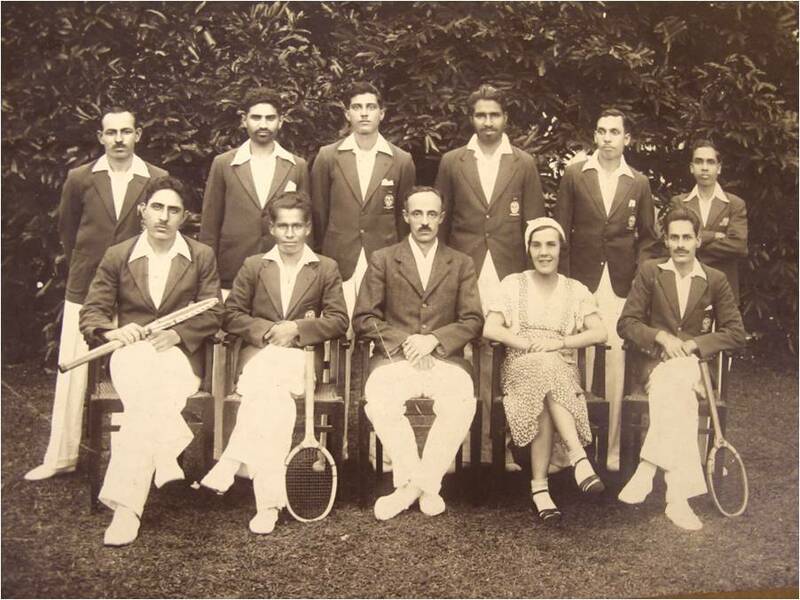 As I was reading Said’s reflections on tennis, I was reminded of the photograph of the Imperial Forest College Tennis Club, taken in 1933 in Dehra Dun, India. I have had this photograph since childhood, since it is the earliest image I have of my paternal grandfather, Brindhavan Bihari Chaturvedi, who was training as a forest official in the 1930s. I was always aware of the connections between empire and tennis as evidenced in the photograph, but some of Said’s comments in his writings are what motivated me to think more systematically about the history of tennis in India. Scholars are no longer surprised to learn that ideas, concepts, practices, and traditions that are considered quintessentially ‘English’ probably have imperial roots. This also appears to be the case for the founding of modern lawn tennis. In addition, the recent interventions in history of science, the new imperial history, world history, gender history, history of sport and intellectual history have provided me important further insights to thinking about tennis as part of a study on the history of empire. What has your research uncovered to date? The standard narrative of the origins of lawn tennis begins with a figure named Walter Clopton Wingfield, who is attributed as the founder or inventor of modern lawn tennis in 1873. He apparently invited some guests to a party where he introduced a game called Sphairestike—a Greek term roughly translated as ‘belonging to the game at ball’ or ‘games of ball’—in today’s terms ‘ball games’. The game soon became known as ‘Sticky’, and it was played with wooden rackets and rubber balls on a lawn. Wingfield provided a set of rules to play the game, which was a big success at the party. He claimed that he had developed a game that men and women could play together. For example, Wingfield writes, ‘[lawn tennis] has the advantage that it may be played in the open air in any weather by people of any age and of both sexes…this game has the advantage that…the merest [novice or beginner] can learn it in five minutes sufficiently well for all practical purposes’. His idea was to shift tennis away from the royal game of real tennis into democratized lawn tennis that men and women could play together. Moreover, in conceptualizing modern lawn tennis, Wingfield was likely influenced by the Women’s Suffrage movement of the late nineteenth century. Wingfield published his rules for lawn tennis and filed a patent, claiming sole proprietorship of the game. In association with a sporting goods company, he helped to market a DIY kit for setting up a tennis court that included nets, poles, rackets, balls, and a copy of the rules of lawn tennis. The kits were marketed globally, and tennis quickly spread from England to the far reaches of the world. The All England Lawn Tennis and Croquet Club at Wimbledon—the cathedral of lawn tennis—celebrates Wingfield as the founder of the sport. In fact, the Club not only maintains Wingfield’s gravesite in London, but it also takes care Wingfield’s dog’s gravesite. So how does empire enter the frame? In reading the narrative account of the founding of modern lawn tennis by Wingfield, or the historiography of tennis, more generally, what is simply not mentioned are Wingfield’s links to India or the British Empire. We know, for example, that Wingfield arrived in India in January 1858 as a member of the 1st Dragoon Guards—a cavalry regiment in the British Army—after the mutiny and rebellions of 1857. He was initially posted in Madras, before being sent to Bangalore, where he was promoted to the rank of captain. In March 1860, Wingfield was sent to China; he returned to Madras in 1861, before going back to Britain at the rank of major. While a great deal more research still remains to be done on Wingfield’s life story, we know that the military bases where Wingfield was posted had tennis courts, where it is likely that he was already experimenting with modern lawn tennis. But Wingfield was not the solitary figure in pursuit of playing the sport. There is evidence that in the Bombay Presidency, another form of lawn tennis called ‘Hindoo Tennis’ was already being played in the early 1860s. At this early stage of research on ‘Empire’s Game’ it is clear that there is a ‘hidden history’ of tennis in India that goes beyond Wingfield and the debates on the founding of modern lawn tennis. Journalists report that some of the very best tennis players in India in the late-nineteenth and early-twentieth century were the Indian servants of British officials. Europeans in India would travel to cities like Allahabad and Kapurtala to play tennis with these servants. Unfortunately, we don’t know the names of these individuals, as they were not allowed to compete in tournaments, but regularly beat the best competitive players in India. The history of tennis must also consider the technological advances of the nineteenth century that allowed for the development of lawn tennis. Without the lawn mower and vulcanized rubber balls, playing tennis would have been impossible. The extraction of rubber from Assam’s rubber trees in eastern India, to the transportation of the rubber to German tire factories that made tennis balls for British sporting goods companies, to the eventual exporting of balls back to India, also marks an important part of this history. As do the debates by tennis players that volleying at the net was a feminine form of playing tennis in India, as opposed to the baseline play of masculine tennis players from England. M.K. Gandhi, the Mahatma, also contributed to the debates on tennis in India by denouncing the sport as reflecting the worst aspects of ‘Western Civilization’. Interestingly, Wingfield argued the exact opposite: tennis represented the best of Western Civilization. Who would have imagined that the debates on the clash of civilizations had early origins in discussions on tennis?! I envision ‘Empire’s Game’ as an extension of my first two book projects that were situated at the intersections of social and intellectual history. I have long been interested in examining the movement of ideas in my earlier work within the context of nineteenth and twentieth century India. Here I am thinking of the movement and circulation of the globalization of tennis both as an idea and a practice. As I am still in the process of conducting research on this book, it is too early to provide further conclusions. What is clear is that I am no longer able to watch Wimbledon without thinking that the annual spectacle really reflects nostalgia for empire. Edward Said, ‘John McEnroe plus Anyone’, London Review of Books, 21, 13 (1999), 34-35. Edward Said, Out of Place: A Memoir (New York, 1999). Walter Clopton Wingfield, The Game of Sphairistike or Lawn Tennis: A Facsimile of the Original Rules of Tennis (Wimbledon, nd). George E. Alexander, Wingfield: Edwardian Gentleman (Portsmouth, 1986). This entry was posted in Uncategorised on 5th November 2015 by Grainne Goodwin.